I've made these tasty mushrooms for many parties, from casual birthdays, to suit and tie Oscar nights, and they're always a big hit! Soak cashews in water for at least 1 hour and drain. Blend cashews with 1 cup water until creamy. Add more water a tablespoon at a time if needed. Brush dirt from mushrooms. Carefully break off stems and reserve the caps. Chop stems very finely, discarding tough ends. Heat oil in a large skillet over medium heat. Add onions, celery, chopped mushroom stems and garlic to the skillet. Sauté until onions are translucent, taking care not to burn garlic, about 2 minutes. Add chopped parsley and cook for about a minute more. Stir cashew cream, nutritional yeast, salt, black pepper, onion powder, and cayenne pepper into the cooled mushroom mixture. 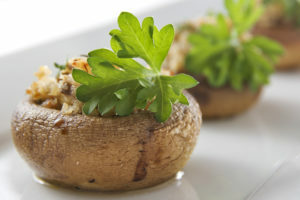 Spoon filling into each mushroom cap with a generous amount of stuffing. Arrange the mushroom caps on a lightly oiled or non-stick baking sheet.